Samsung has suspended production of its Galaxy Note 7 smartphones following reports of fires in replacement devices, South Korean media said on Monday, a further setback for the tech giant trying to manage its worst ever phone recall crisis. Samsung’s decision to temporarily halt Galaxy Note 7 production was done in cooperation with authorities in China and the United States, as two US carriers havestopped exchanging or selling new Galaxy Note 7 phones, Yonhap News Agency cited an unnamed source at a Samsung partner firm as saying. Samsung did not immediately comment on the Yonhap report. Problems with replacements for the Galaxy Note 7 model would create a new and potentially costly chapter to a global scandal which has hurt the reputation of the world’s biggest smartphone maker. It also could add new dangers for consumers. AT&T, the No.2 US wireless carrier, said on Sunday it will stop exchanging new Galaxy Note 7 smartphones due to reports of fires from replacement devices that Samsung has said used safe batteries. No.3 wireless carrier T-Mobile US said it was temporarily halting sales of new Galaxy Note 7s as well as exchanges while Samsung investigated “multiple reports of issues” with its flagship device. T-Mobile offered customers who brought in their Galaxy Note 7s a $25 credit on their phone bill. Samsung announced on September 2 a global recall of 2.5 million Galaxy Note 7s in 10 markets including the United States due to faulty batteries causing some of the phones to catch fire. A Southwest Airline flight was evacuated earlier this week after a replacement model Galaxy Note 7 smartphone began smoking inside the plane, according to the family who owns the phone. Samsung earlier said it was investigating reports of “heat damage issues” and would share its findings when the investigation is complete. “If we determine a product safety issue exists, Samsung will take immediate steps approved by the CPSC (US Consumer Product Safety Commission) to resolve the situation,” Samsung told Reuters in a statement. Samsung shares were down 3.3 percent as of 0125 GMT, compared with a 0.1 percent fall for the broader market. 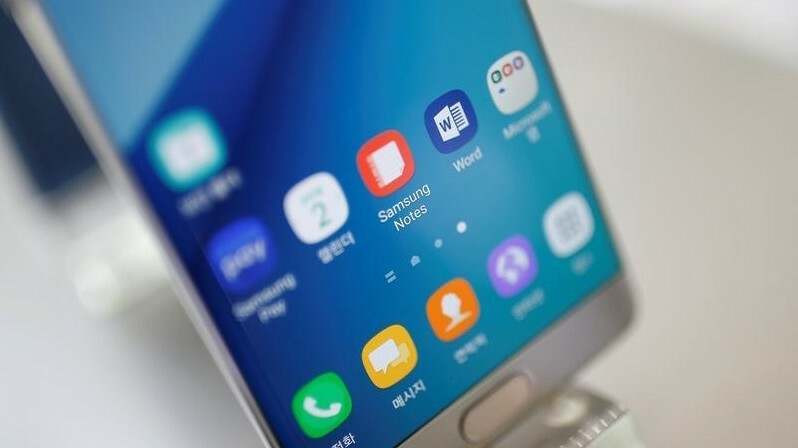 “I thought the Galaxy Note 7 matter was coming to an end, but it’s becoming an issue again,” Alpha Asset Management fund manager CJ Heo said. Samsung should be able to recover from the short-term reputational damage of the recalls, but fourth-quarter sales of the Galaxy Note 7 would be hurt, he added. South Korea’s largest mobile carrier, SK Telecom, said it was closely monitoring the situation and would not comment further. KT Corp, the No.2 South Korean carrier, said it had taken no steps in regards to sales or exchange of new Galaxy Note 7s.